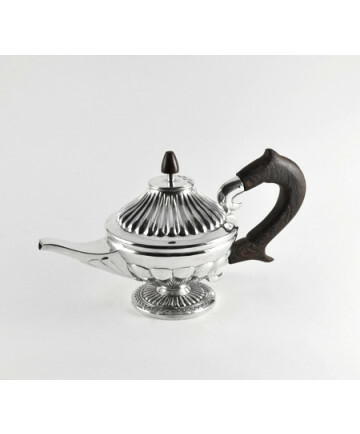 Sterling Silver Teapot by Edison Cummings (Navajo) Edison Cummings was born in 1962 and studied at ASU in Tempe, AZ as well as at the Institute of American Indian Art in Santa Fe, NM. He was featured in the summer 2005 issue of American Indian Art in an article titled "Native American Silversmiths of the Southwest". He is known for his inlaid sand and tufa cast jewelry. 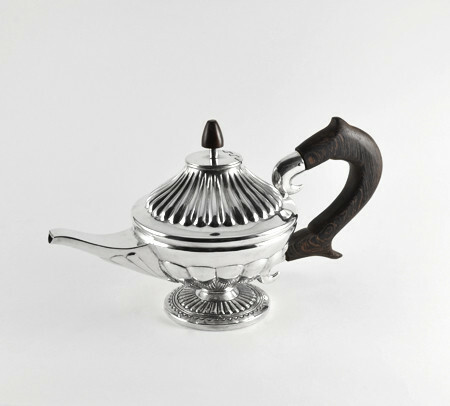 This teapot measures 6 inches tall (at highest point), about 11 1/2 inches long (from spout to handle) by 5 1/4 inches wide (width of actual pot).